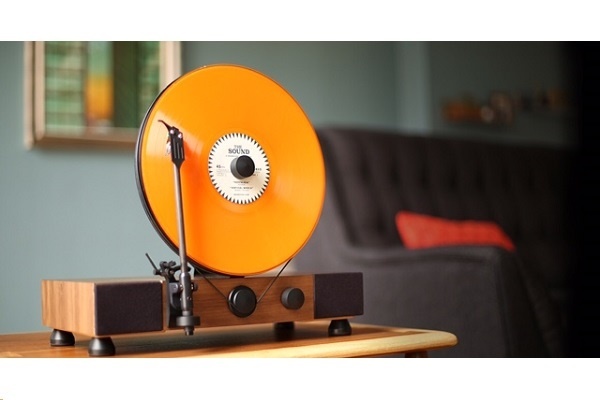 Gramovox, a consumer electronics start-up that re-imagines vintage audio design with modern technology that is distributed by The Sound of Vinyl in Australia, is celebrating 140 years of vinyl with the Floating Record Player. 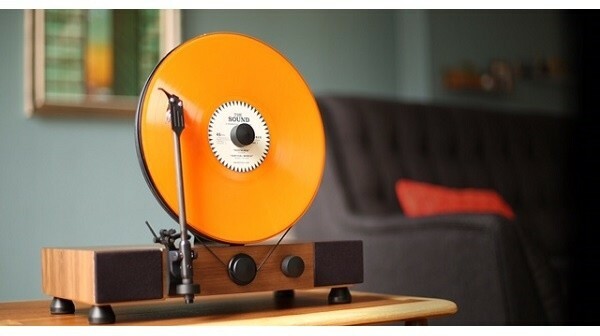 Combining the beauty and nostalgia of yesterday’s turntable with modern sound technology and contemporary design, the Floating Record Player is hand-assembled in Chicago and hand-tuned by electro-mechanical engineers. It comes with dynamic full-range stereo speakers, built-in RCA line out ports and built-in 3.5mm stereo jack for headphones. Users can easily switch between formats, catering to both 33 ⅓ or 45RPMs by moving the silicon belt over the inner or outer groove of the middle gear, plus record clamps for both types of records are provided. “We treat vinyl as the art form that it is. Watching the vinyl as it spins, which always looks so different from record to record, is all part of the experience. We wanted to create a visceral vinyl experience that showcased the record as both art and a medium to produce fantastic sound. We want our products to evoke nostalgia, to bloom in the design space, and allow you to rediscover the way you experience your music,” says Gramovox co-founder and chief executive Pavan Bapu. The Floating Record Player is an easy to use, all-in-one system with a walnut veneer wood base and carbon-fibre tone-arm. It’s also international voltage compatible, with vibration dampening feet and a pre-installed AT95E cartridge. There has been a resurgence of interest in vinyl over the past decade and in 2016 sales of vinyl reached a 25-year high. Deloitte predicts that global vinyl sales in 2017 will approach US$1bn (AUD$1.36bn), which will generate globally 15% of all physical music sales and 6% of all recorded music revenues. Many believe that nostalgia is the driving force behind this increase in vinyl sales but data shows almost 50% of vinyl customers are 35 years or younger. The most active demographic are the 25-35 year olds who make up 33% so it appears that while streaming is still as popular as ever, the desire to own music that is both tangible and visual is increasing. “The vinyl trend really picked up again about seven years ago here in Australia and our sales show it goes from strength to strength each year. We’re finding a lot of people who sold their vinyl collection when they moved to CDs are now not only experiencing nostalgia for a more tangible style of music, they’re at an age where they can also afford to replace their much loved collections,” says independent record retailer Egg Records’ Barry Scott. Vinyl sales received another boost last month, with record stores around the country celebrating the 10th annual Record Store Day on Saturday April 22. Created to celebrate the culture of the independently owned record store, the day brings together fans, artists, and thousands of independent record stores across the world. “Record Store Day has brought a whole new audience into stores to find out what is this thing called vinyl is. Each year it seems to be getting bigger and it’s great to have a celebration of both the music and the small independent stores who are keeping it alive. Where else can you go to hear and learn about new and old music, and talk to people who have a passion about what they love,” says Barry. A number of records are pressed specifically for Record Store Day, with a unique list of releases for each country. The event began in the United States and now has official international organisers in the UK, Ireland, France, Germany, The Netherlands, Italy, Japan, Mexico, Spain and Australia.